2019 2018 2017 2016 2015 2014 2013 2012 2011 2010 2009 Questions? *Please note trip dates may be updated prior to release! What is the Summer Programme? Every summer we take our yacht Skylark on a sailing adventure to a destination we otherwise wouldn’t be capable of reaching during term-time! This year we have decided to visit the Baltic! Our yacht, Skylark is a Beneteau First 40.7, bought by the Club in 2016. She has three cabins, each sleeping two persons with an additional two berths in the Saloon. She is equipped with state-of-the-art navigation and safety equipment as well as many domestic comforts including a fridge, gas oven & hobs, diesel heater and BBQ! At the beginning of each trip, the new crew meets Skylark at the pre-determined destination, receiving her from the previous crew. 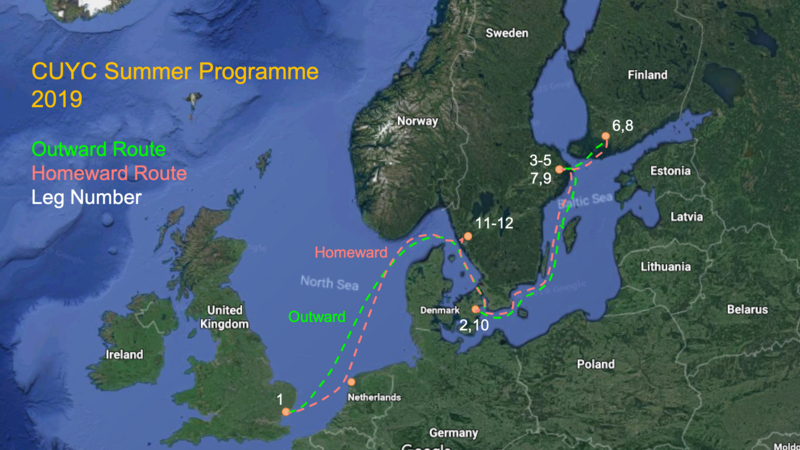 The new crew must then sail Skylark to the next destination in the allocated time but is otherwise free to explore the area in which ever way they choose. On every trip a fully-qualified skipper and first-mate will be there to teach you the ropes, help you to navigate and keep everybody safe. It is important to note our trips are not designed as holiday packages and everybody on board will have equal responsibility for sailing, navigating, cooking and keeping the boat clean! You must first become a member of Cambridge University Yacht Club before signing up to our trips. Our membership fee is currently £15 per year. Each trip will then cost £195 per week for current students of the University of Cambridge and £230 for senior members (past-students of the University of Cambridge) and £250 for affiliate members. This fee is used to cover the cost of maintaining Skylark and ensuring we can continue to run future trips. Additional costs are then incurred throughout the trip including the cost of food, diesel and marina fees. At the end of the trip the total additional costs are divided equally amongst all members on board and paid through the CUYC website. We are also able to offer each crew member a full set of waterproofs and boots to hire for a fee of £15.00. Travel to and from the boat. You will be responsible for any costs involved in travelling to and from the boat but please do not book any travel before your place has been confirmed and you have heard from your Skipper. All of our meeting points are easily accessible and have been chosen to keep costs to a minimum. Please note, priority will be given to Junior members before places are allocated to Senior and Affiliates members.